Ask about our pizza / focaccia making masterclass using our pizza oven. 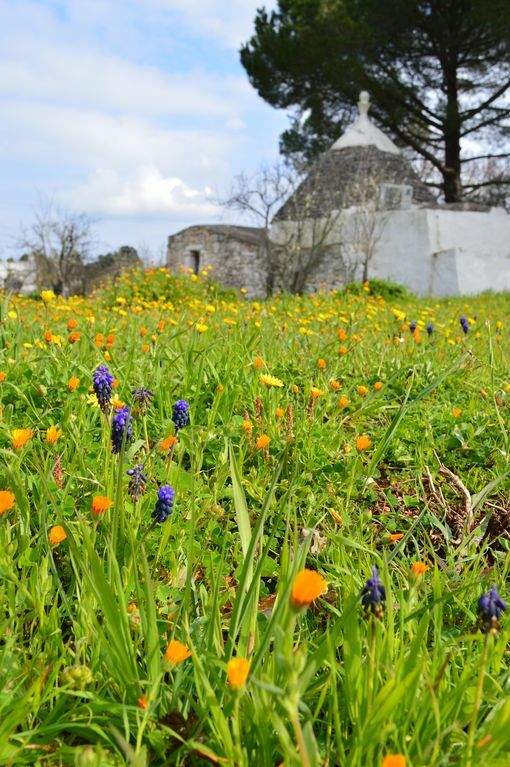 Trullo Tranquillo is a romantic one bedroom stone trullo sleeps 3, nestling in 1.5 acres of fruit and nut trees in the heart of the beautiful and peaceful Puglian countryside. The perfect place to relax in the quiet surroundings. The kitchenette is well equipped and the trullo has its own external wood-fired pizza oven with paddle. Enjoy the organic fruits of the trullo's land when in season. 2 bicycles are available for guests to use. I am a graphic designer and artist based in Suffolk, England. I love all things Italian and decided to purchase a holiday home in the beautiful Puglian countryside. I holidayed in Trullo Tranquillo (then known as Trullo Oleandro) in June 2016. I fell in love with this gorgeous little trullo set in its tranquil land and purchased it mid August 2016. I very much hope you enjoy your stay here too. Stay in Trullo Tranquillo for the perfect retreat and a great opportunity to experience a beautifully restored ancient cone building. "A trullo (plural, trulli) is a traditional dry stone hut with a conical roof. Their style of construction is specific to the Itria Valley in Puglia, Southern Italy. Trulli were generally constructed as temporary field shelters and storehouses or as permanent dwellings by small proprietors or agricultural labourers." Loved the trullo which provided a good base for exploring the local countryside and major tourist attractions in the area. The trullo was reasonably well equipped for two, but any more would be very cramped. We have just had a very relaxing stay in trullo tranquillo. It just wouldn't have been right to holiday in Puglia and not stay in a trullo......and this was a beautiful example. Well kitted out, with everything you need - the pizza oven especially, helped to make this an authentic experience. Set in 1 1/2 acres, the garden feels very private and is well stocked with fruit and nut trees. We enjoyed visiting the nearby towns - Ceglie, the nearest town, was full of character and characters(!) and everyone we came across was friendly and helpful. Thank you Sharon for allowing us to stay in your trullo and thank you to Claudia for all your help. I would recommend this property for anyone wanting a tranquil holiday! Thank you Angie, I am delighted that you enjoyed your stay so much! Great place to spend some time to get away from it all! Thank you very much Matthew. We do hope to see you again at the trullo. Thank you Jodie for your lovely review. I am glad you had an enjoyable stay and had fun cooking your own pizza. Lovely Trullo and area-highly recommend. The Trullo has been nicely kitted out with everything you need and has a really comfortable bed! The outside space is lovely and feels very private. We enjoy meals outside and relaxing on the hammock. It's in a good place to base yourself to visit all the beautiful towns and countryside of Puglia. Sharon was really responsive and helpful with any information we needed before and during our stay. We really enjoyed our stay in a Trullo and would highly recommend it. Wir haben 4 Tage in dem ruhig gelegenen Trullo verbracht. Claudia hat uns vor Ort sehr herzlich empfangen und uns mit guten Tipps für Ausflüge in die Umgebung versorgt. Das kleine Steinhäuschen ist nett eingerichtet und einfach, aber zweckmäßig ausgestattet. Durch die dicken Steinmauern bleibt es in den Räumen auch im Hochsommer angenehm kühl, bei allerdings auch hoher Luftfeuchtigkeit. Durch die ländliche Umgebung finden sich auch Spinnen, Tausendfüssler und Insekten im Haus.